Most people know about catching buses from New York City’s Chinatown to Philadelphia, Boston and Washington DC for $20 or less. Did you know that you can catch a bus to Wilmington, Delaware, too? The Chinatown bus business has extended to remote locations along the I-95 corridor. For $20, you can get a bus from New York’s Chinatown or right in front of Macy’s on 34th street to downtown Wilmington, Delaware. 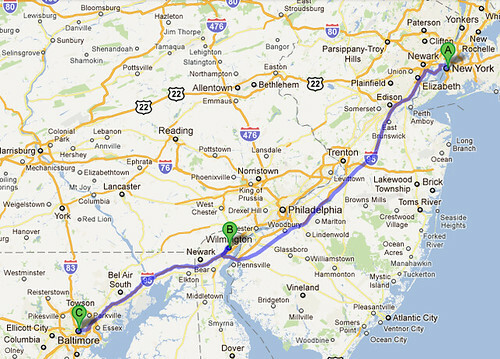 That same bus will also go to Baltimore, Maryland after it stops in Wilmington. The cost of gas and tolls alone would cost you $20 from NYC to Wilmington. The bus option is much cheaper than the Amtrak which is $95 one-way during peak hours and $50 one-way during off peak hours. The buses also run in both directions every hour – making the travel option inexpensive and convenient. For the folks in NYC who need to open up Delaware companies or visit major banks down there, the Chinatown bus is the way to go. For people from Delaware, I think this is a great way to visit the Big Apple. Click here for more information about the bus company that can get you there. I’ll right away clutch your rss feed as I can not in finding your e-mail subscription hyperlink or newsletter service. Do you’ve any? Kindly permit me recognize in order that I could subscribe. Thanks. Have you ever considered about including a little bit more than just your articles? I mean, what you say is valuable and all. But think of if you added some great visuals or video clips to give your posts more, “pop”! Your content is excellent but with pics and video clips, this site could undeniably be one of the best in its niche. Terrific blog! After study a handful of the weblog posts with your internet site now, we definitely like your strategy for blogging. I bookmarked it to my bookmark online site list and are checking back quickly. Pls look into my web page also and make me aware what you look at. off subject but I simply wanted to ask. Thanks a lot! now not actually a lot more neatly-liked than you might be now. it from a lot of numerous angles. Its like men and women are not interested unless it’s something to do with Girl gaga! fresh spin on a subject that has been discussed for years. If some one wishes expert view about running a blog then i advise him/her to visit this webpage, Keep up the nice work. else understand such exact about my problem. You’re wonderful! Helpful information. Lucky me I discovered your site unintentionally, and I’m stunned why this coincidence didn’t came about earlier!